LEAMINGTON, Ont. -- Aphria Inc. (APH.TO) (APHA.N) says it stands behind its Latin American operations after its shares were hammered in the wake of a short sellers' report that raised questions about the company's acquisitions in the region. Together with other members of the company's executive team, Neufeld said they personally bought a total of more than $3.1 million in Aphria shares on Monday as a demonstration of confidence in the company. "It is the commitment of our incredible team and partners that has gotten us to where we are today, making Aphria a global cannabis success story," Neufeld said. Shares in Aphria fell nearly 28 per cent in trading Monday after short sellers called the Canadian marijuana producer a "black hole" and alleged that its recent international acquisitions totalling roughly $280-million were "largely worthless." The shares were down an additional 17 per cent or $1.32 at $6.28 in early trading Tuesday. 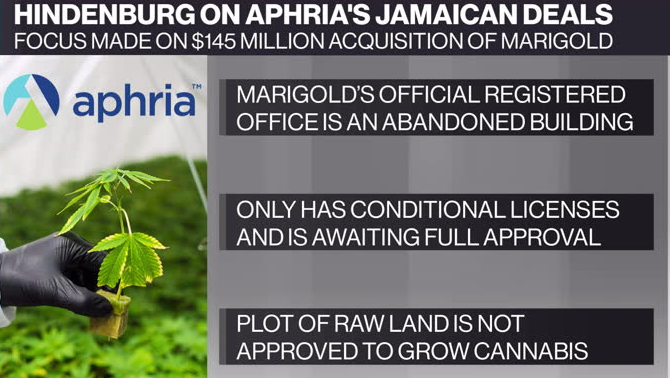 Quintessential Capital Management and Hindenburg Research, which are short on Aphria, alleged the company acquired foreign companies in countries including Jamaica, Argentina and Colombia at "vastly inflated" prices and in ways that it believes benefit a group of insiders. Aphria, one of the largest Canadian cannabis companies by market capitalization, has called the short-sellers' allegations "false and defamatory."